My sister sent me an email yesterday that contained a long list of things that kids growing up in the 70's were exposed to that now are forbidden. 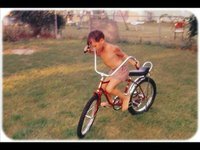 By coincidence, I was searching for a photo today that my dad asked for and came across this shot of me on my 6th birthday (1970). I am learning to ride my new bike (never had training wheels) in the backyard of our house in Va. No shoes, no shirt, and definitely no helmet.